$295 for the pair. 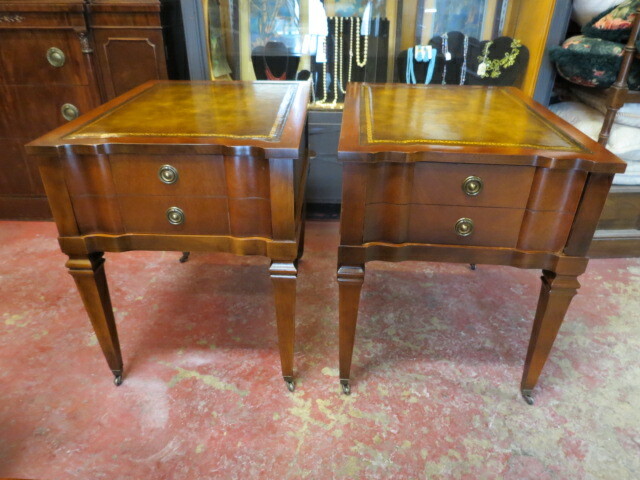 Vintage antique pair of mahogany leather top side tables/nightstands, c. 1940. Leather top with gold embossing. Curved front with one drawer (looks like 2). Original brass hardware. Square tapered legs with metal casters. Perfect for your living room or bedroom. Excellent condition. 19.5in wide, 29.5in deep, 24in tall.